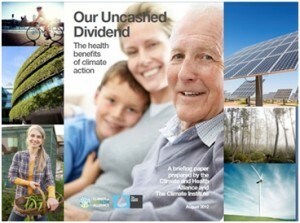 Getting policy traction: The 2012 Climate and Health Alliance report Our Uncashed Dividend produced in partnership with The Climate Institute has hit a chord with media, community, and policymakers. 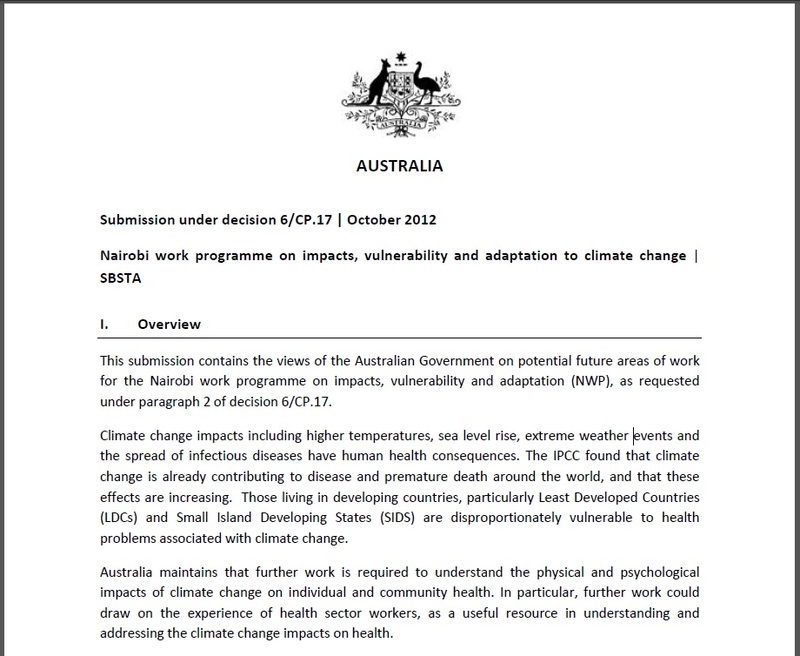 It was released in 2012 to widespread media coverage, has been the subject of many invited presentations, and has stimulated and informed the first ever submission from the Australian Government on health to the United Nations Framework Convention on Climate Change process occurring in October 2012, written following a meeting with CAHA in August 2012. The submission by the Australian Government on health to the UNFCCC took the form of a submission to the Nairobi Working Party of the Subsidiary Body for Scientific and Technological Advice (SBSTA). (The SBSTA is one of two permanent subsidiary bodies to the Convention established by the COP/CMP. It supports the work of the COP and the CMP through the provision of timely information and advice on scientific and technological matters as they relate to the Convention or its Kyoto Protocol. The Nairobi Work Program is set up to to assist all Parties to improve their understanding and assessment of impacts, vulnerability and adaptation to climate change; and make informed decisions on actions and measures to respond to climate change on a sound scientific, technical and socio-economic basis). 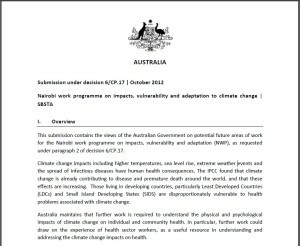 The Australian Government submission proposes that further work be undertaken to "understand the physical and psychological impacts of climate change on individual and community health" and suggesting that this work could "draw on the experience of health sector workers, as a useful resource in understanding and addressing the climate change impacts on health". The Australian Government submission is available here.